MANHATTAN BEACH, Calif.--(BUSINESS WIRE)-- After landing as one of the hottest footwear collaborations of 2018, the Straw Hat Pirates are back for a second limited edition series in the acclaimed Skechers D’Lites X One Piece collection. This ongoing collaboration unites returning and new characters from Toei Animation’s anime series with the next generation Skechers D’Lites 3.0—an evolution of the footwear company’s iconic chunky sneaker. The new Skechers D’Lites 3.0 X One Piece collection spans seven colorful styles for women, and six for men. Returning from the first series are new designs featuring Monkey D. Luffy and Trafalgar Law. Rounding out the range, there are five new characters making their Skechers debut: Jimbei, Whitebeard, Blackbeard, Marco, and Boa Hancock. The new designs will be seen on the Skechers D’Lites 3.0, now with an even chunkier outsole that modernizes the classic retro sneaker profile without losing that old school aesthetic. Following the global rollout of the first series, the new Skechers D’Lites 3.0 X One Piece limited edition collection launches across Asia in January, arrives in the United States early March 2019, and reaches Europe in May 2019. The footwear will be available at Skechers retail stores, www.skechers.com, and select specialty stores. Eiichiro Oda’s One Piece is the best-selling manga in history with more than 430 million copies worldwide. In 1997, it spawned an acclaimed anime series that has produced 890+ episodes. Following the adventures of Monkey D. Luffy and his fearless Straw Hat Pirates, fans are taken on a fantastical journey across a world teeming with wonders and imagination. A multi-generational property, it continues to captivate viewers both young and old. The story and its characters have also expanded across other media into film, television, and video/mobile games, as well as a theme park in Japan. The original Skechers D’Lites X One Piece collection launched in January 2018 with awareness driven by media coverage on fashion site Highsnobiety. Popular trend-focused outlets Hypebeast and Hypebae also helped spread the word on the first series and will continue their media partnership by generating global excitement for series two. Skechers pioneered the chunky sneaker look two decades ago with the Skechers Energy for men and women as well as the Skechers Stamina for men. The style evolved and the Company introduced Skechers D’Lites—a lighter version of its original style—in 2007. Though the collection has always had a dedicated consumer base, sales accelerated across Asia over the last two years after regional marketing included K-Pop groups. In 2017, the Company relaunched an even lighter update of Skechers D’Lites in celebration of its ten-year anniversary. 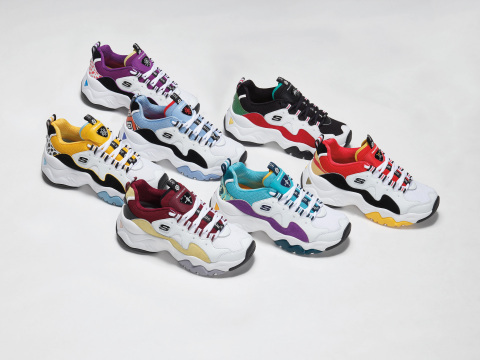 Skechers will be celebrating the 20th anniversary of the Skechers Energy with a revival of the original style in 2019. Skechers U.S.A., Inc. (NYSE:SKX), based in Manhattan Beach, California, designs, develops, and markets a diverse range of lifestyle footwear for men, women, and children, as well as performance footwear for men and women. Skechers footwear is available in the United States and over 170 countries and territories worldwide via department and specialty stores, 2,802 Skechers Company-owned and third-party-owned retail stores, and the Company’s e-commerce websites. The Company manages its international business through a network of global distributors, joint venture partners in Asia and the Middle East, and wholly-owned subsidiaries in Canada, Japan, throughout Europe, and Latin America. For more information, please visit about.skechers.com and follow us on Facebook, Instagram, and Twitter. Based in Los Angeles, Toei Animation Inc. manages the film distribution of Toei’s top properties, including Dragon Ball all series, Sailor Moon, One Piece, Digimon series, Saint Seiya, and many others to North America, Latin America, South Africa, Australia, and New Zealand. Toei Animation’s Los Angeles office further handles all categories of consumer product licensing based on its film and television brands within these territories. For more information, please visit http://www.toei-animation-usa.com/. This announcement contains forward-looking statements that are made pursuant to the safe harbor provisions of the Private Securities Litigation Reform Act of 1995. These forward-looking statements include, without limitation, Skechers’ future domestic and international growth, financial results and operations including expected net sales and earnings, its development of new products, future demand for its products, its planned domestic and international expansion, opening of new stores and additional expenditures, and advertising and marketing initiatives. Forward-looking statements can be identified by the use of forward-looking language such as “believe,” “anticipate,” “expect,” “estimate,” “intend,” “plan,” “project,” “will be,” “will continue,” “will result,” “could,” “may,” “might,” or any variations of such words with similar meanings. Any such statements are subject to risks and uncertainties that could cause actual results to differ materially from those projected in forward-looking statements. Factors that might cause or contribute to such differences include international economic, political and market conditions including the challenging consumer retail markets in the United States; sustaining, managing and forecasting costs and proper inventory levels; losing any significant customers; decreased demand by industry retailers and cancellation of order commitments due to the lack of popularity of particular designs and/or categories of products; maintaining brand image and intense competition among sellers of footwear for consumers, especially in the highly competitive performance footwear market; anticipating, identifying, interpreting or forecasting changes in fashion trends, consumer demand for the products and the various market factors described above; sales levels during the spring, back-to-school and holiday selling seasons; and other factors referenced or incorporated by reference in the Skechers annual report on Form 10-K for the year ended December 31, 2017, and its quarterly report on Form 10-Q for the three months ended September 30, 2018. The risks included here are not exhaustive. Skechers operates in a very competitive and rapidly changing environment. New risks emerge from time to time and the companies cannot predict all such risk factors, nor can the companies assess the impact of all such risk factors on their respective businesses or the extent to which any factor, or combination of factors, may cause actual results to differ materially from those contained in any forward-looking statements. Given these risks and uncertainties, you should not place undue reliance on forward-looking statements as a prediction of actual results. Moreover, reported results should not be considered an indication of future performance.